This is a sample of Wedderburn putting in an aerial photo without revising any of the previous map content. This will only take a little time. The issue of quality in resizing is down to the interpolation algorithm used. The Gimp default of "Cubic" is actually not too good. So choosing a better algorithm improves the quality, as does saving a Jpeg into a Png before importing it into Gimp. The rotation does seem to lose quality and I don't know yet how this might be addressed. 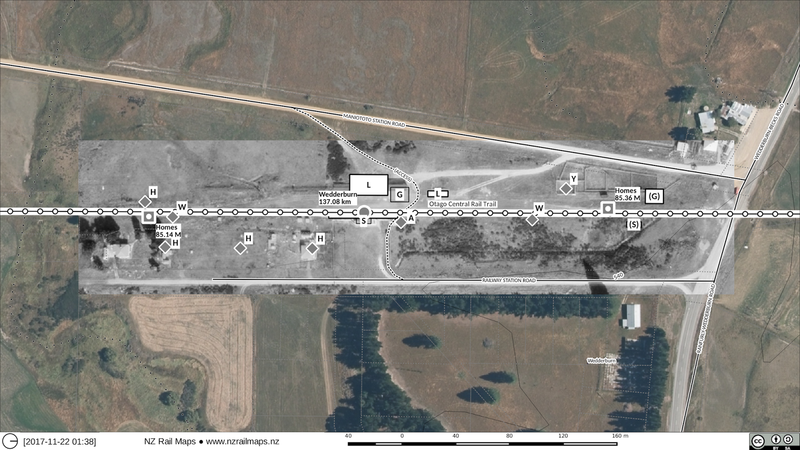 The aerial shows that Wedderburn is another station that lost the annex at one corner when it was first moved. The relocated building is therefore smaller than the original shown in this aerial. Lauder is another example. In fact with buildings that have been retrieved by the Rail Trail Trust, few are complete.